Fuel trucks and oil trucks – known in the trucking industry as tank trucks, tanker trucks, or tankers – typically carry cargo in gas and liquid form to all of us across the country. These giants of the road can haul everything from water and milk our children drink, to the oil and gasoline we depend on, and the hazardous chemical loads that our homes require to function efficiently. When something goes wrong, and a fuel truck driver stops giving full attention to the duties they have agreed to take on, these large commercial vehicles can contribute to horrific accidents that leave victims with challenging and life-threatening injuries or even wrongful death. Driver negligence is the top reason we take on truck accident cases involving tankers. 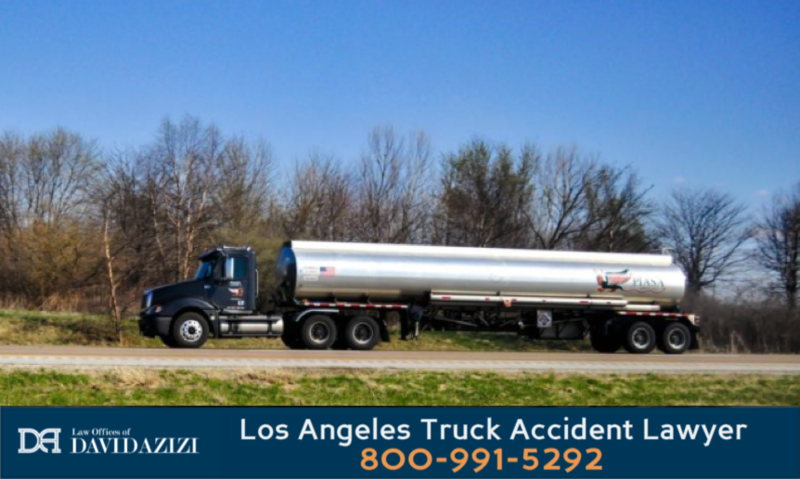 If you or a loved one have been injured in an incident or accident with a tanker truck, semi-truck, or other large commercial vehicle, Los Angeles fuel truck accident lawyer David Azizi can help you take the necessary steps to get the justice and financial compensation you deserve. Call us 24/7 at 800-991-5292 to begin your accident evaluation today. Tanker trucks come in a variety of types with the common theme of hauling liquid, gas, and container-filling dry loads like fertilizer, salt, sand, or grains. They typically have a cylindrical-shaped tank built into a flatbed big rig or truck and can be classified into small, medium, or large size commercial vehicles, all based on the weight of the load they carry. Many tankers will include pressurization, refrigeration and several compartments designed to keep cargo from shifting and becoming unstable with too much movement. How Much Cargo Do Tanker Trucks Haul? In 2017, an Arco tanker truck crashed into a car when the tank truck jumped the center divider on the 5 Freeway in Los Angeles. Thankfully these injuries did not require hospitalization. A similar incident happened when a milk truck rolled over, this time with injuries. It’s often the size of these trucks that makes an accident with a tanker truck particularly dangerous. But by far the most common cause of tank truck accidents is a form of driver negligence. In California, crashes with semi-trucks like those used by large tankers kill more people than in any other US state. These tanker drivers require specialized training and must carry required endorsements certifying that they are qualified to drive double and triple trailer trucks and pull cargo that includes hazardous materials. These truck drivers accept greater responsibility and owe a higher standard of duty and care to those they share the road with. When a truck driver fails to abide by the dozens of known legal standards and causes a crash, in most cases they have broken laws. Failing to live up to accepted duties and causing an accident with injuries falls under the legal category of negligence. If you have been affected by the negligent act of a tanker driver or company, it’s time to consider your legal options. Safety is always your top priority after an accident with a tanker truck. Our team is ready to assist with retrieving hospital records and we always encourage clients to attend every scheduled doctor visit. Trucking companies will seek to scrutinize these records and skipping appointments could imply that your injuries are not really that significant. Drafting & Sending Your Letter of Representation – This is our first move to notify the trucking companies you have a dispute and claim of wrongdoing and that you now have an experienced tanker truck accident lawyer who will be a professional advocate for you in these legal matters. Filing Your Legal Complaint – The “complaint” is the very first document that begins your case. We will submit this to the court clerk and when the defense receives it, they know you mean business. The complaint will explain the evidence we have, the nature and extent of your injuries, it will designate that the truck and/or company are responsible (known as “liability”) and will include your demand for justice and financial compensation (known as “damages”). Answer From The Truck Driver – When we file your complaint to begin the case, the defense will make their first response, giving an“answer” to your claims that they wronged you. If they admit liability and agree to pay you what you demand, we’ll negotiate those final details for an out of court settlement. Bringing a lawsuit against the trucker to trial – In these large cases, the trucking company often will deny liability and will refuse to pay what you demand and deserve. For that reason, we are always prepared to file a truck accident injury lawsuit. This means your case is on its way to a trial where an attorney will fight for your case (known as “litigation”), presenting evidence about your crash and injuries before a judge or jury to hand over a verdict about the dispute. One of the most common questions our California truck accident law firm gets is, “does my case stand a legitimate chance of winning?” That’s exactly what we would love to review and cover with you in our free case evaluation. When you schedule your consultation, David Azizi and team will listen to your story, look at the evidence, assess your medical bills, damage to your personal property, any wages you’ve lost because of your injuries and the amount of pain and suffering you are dealing with. Our truck accident settlement calculator can give you a first glimpse at what your case is worth. Our goal is to get you justice and the maximum financial compensation possible in the least amount of time. We are ready to hear your important story and are standing by to chat or receive your call 24/7. Our contingency payment structure means that we fund all expenses of your case and only if you win do you pay, out of the compensation you have received. If we do not win, you do not pay. Do not delay in filing your case. The statute of limitations (the deadline for filing a lawsuit) for truck accident cases is sometimes as short as six months. Ready to begin? 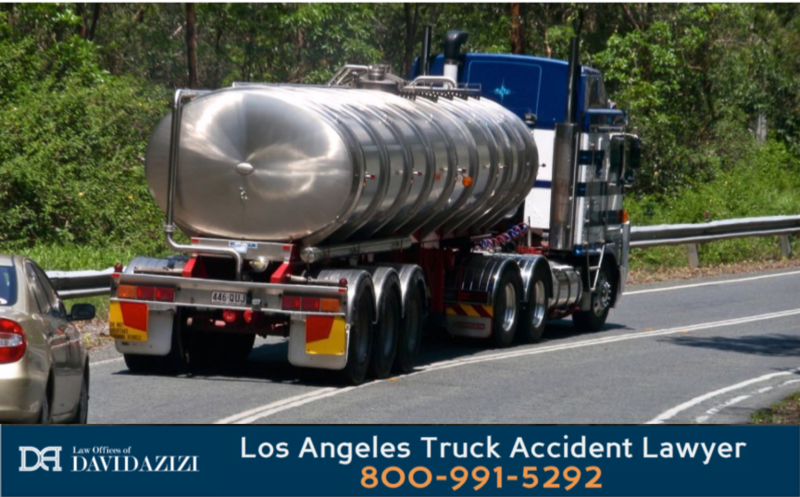 Call Los Angeles tanker truck accident attorney David Azizi at 800-991-5292 to get started. We are ready to give your case our full attention to get you the justice and money you deserve.